As disclosures about sexual misconduct emerged last year, 44% of all members of Congress raised the issue on their official Facebook accounts. But the percentage of women legislators who discussed the topic in their official Facebook posts was almost twice as high as the percentage of men in Congress who did so (72% vs. 37%), according to a Pew Research Center analysis of 44,792 posts published between Oct. 1 and Dec. 30, 2017. There were wide gaps across the two major parties: 55% of Democratic members and 34% of Republican members made posts about the topic. In both parties, the shares of women who discussed sexual misconduct on Facebook were 30 percentage points larger than the shares of men who did so. Posts about sexual misconduct did not dominate lawmakers’ Facebook outreach during this period, but they did reflect a gender gap in what members of Congress addressed on social media. Among all Facebook posts by female lawmakers, 2.9% discussed sexual misconduct, while just 0.8% of all posts by male legislators mentioned the topic. This gap held true across party lines. Democratic men in Congress posted on the subject in 0.9% of posts, compared with 0.7% for Republican men. But Democratic women posted about it in 3.2% of posts, while the subject accounted for 1.8% of the posts created by Republican women. This pattern is consistent with surveys of the U.S. public, which show that women are more likely than men to see online harassment as a “major problem,” while both women and Democrats are more likely to say that sexual harassment allegations reflect widespread problems in society. 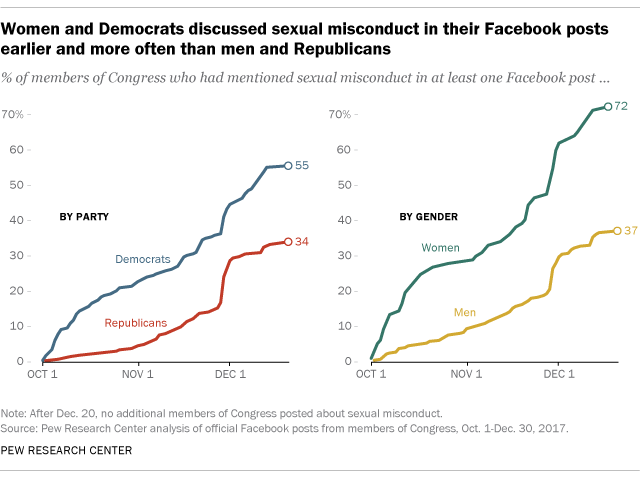 Women and Democrats in Congress also posted about sexual misconduct sooner than did men and Republicans. By Nov. 1, 28% of female legislators and 23% of Democrats had posted about sexual misconduct, while just 9% of men and 5% of Republicans had done so. By Dec. 1, 62% of women and 45% of Democrats had posted about misconduct, versus 30% of men and 29% of Republicans. Facebook posts about the sexual misconduct issue spiked in December as the issue drew increasing attention. On average, posts about sexual misconduct during the time frame under study generated more engagement – in terms of “likes” and comments – than all other posts from both men and women in Congress. For women in Congress, posts discussing sexual misconduct received 68% more likes and 56% more comments on average, when compared with the number of likes and comments each female legislator typically received on other posts she made during the same time period. 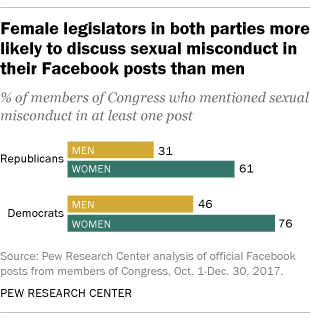 Among male legislators, posts about sexual misconduct saw an average of 52% more likes and 70% more comments than usual.